People today use the terms cussing and swearing to refer to just about any vulgarity or “adult talk.” But the word swearing has a very distinct meaning—to call on God as your witness, as the gold standard for truthfulness, to punish you if you are lying. The real sense lingers on in court and with the inauguration of public officials as they place a hand on a Bible, which theoretically means that they realize that they are accountable to a higher power. “Oh, God!” “Oh, my God!” “Swear to God.” Those words have lost their meaning in today’s conversations. Their only purpose is to serve as an intensifier, as the speaker tries to amplify the emotion of what was just said. The words, however, mean that you are calling on God as your witness that you are not lying. Here is how Jesus felt about having his name used in that way: “Do not swear at all: either by heaven, for it is God’s throne; or by the earth, for it is his footstool. . . . Simply let your ‘Yes’ be ‘Yes,’ and your ‘No,’ ‘No’; anything beyond this comes from the evil one” (Matthew 5:34,35,37). What you will find is that if you develop a reputation for speaking only the truth, you won’t need to trot God’s name out as if he were your chief character witness. Jesus wanted his people to be known for their love. But sadly, love is often the last thing homosexuals find in the church. 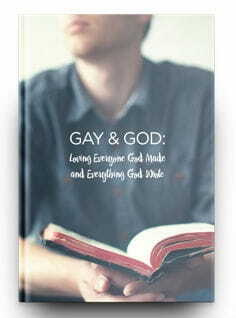 This brand-new resource from Time of Grace called Gay & Godshows youthe deep meaning and true significance of Jesus’ words, “Love your neighbor as yourself.”It also teaches you what the Bible actually says on the topic of homosexuality—and empowers you to show practically the love of Christ in a culture where being gay is the new normal.